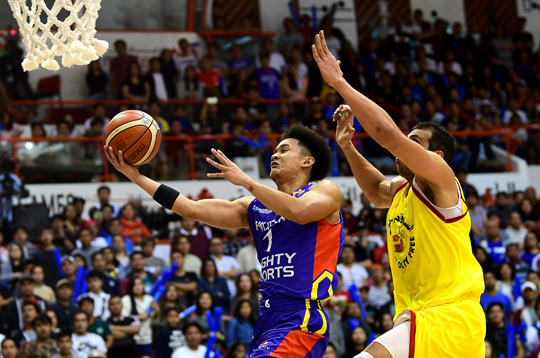 Dubai, United Arab Emirates— Up against “Barangay Ginebra” of Lebanon, Mighty Sports gave everything it can but its best was not enough, absorbing an 89-84 loss to Al Riyadi in their knockout semis duel Friday showdown in the 30th Dubai International Basketball Championship at the Shabab Al Ahli Club here. Led by the hot-shooting duo of Wael Mazen Arajki and import Dominic Johnson, the Lebanese buried the Mighty Sports dribblers with a hail of 3-point shots to arrange another all-Lebanese showdown in the annual tournament. In all, Al Riyadi collected 16 triples, six coming from Johnson, against only six for Mighty Sports which struggled defensively early on—no thanks to its rival’s impressive ball screen plays. The loss relegated Mighty Sports to a battle for third against Homenetmen—a team it beat, 96-89, in their group elims Sunday. Regardless of the outcome, Mighty coach Charles Tiu and co-team owners Alex and Caesar Wongchuking already considered its campaign here a success. Three straight triples to open up the second half gave Al Riyadi an imposing 63-40 lead over the team backed by Go For Gold, SMDC, Oriental Group and Healthcube. Al Riyadi, however, simply refused to be intimidated, sealing the win with a completed three-point play by Christopher Obekpa off Justin Brownlee’s foul. Brownlee finished with 24 points while the 6-foot-10 Morris quietly contributed 21 after being held to just 7 points in the first two quarters. AL RIYADI 89—Arakji 23, Johnson 20, Saoud 12, Abdelnour 10, Abdelmoneim 9, Gyokchyan 8, Obekpa 7, Bowjee 0, Khatib 0. MIGHTY SPORTS 84—Brownlee 24, Morris 21, Gray 17, De Liano 8, Brickman 8, Adams 4, Santillan 2, Odom 0, Banal 0.